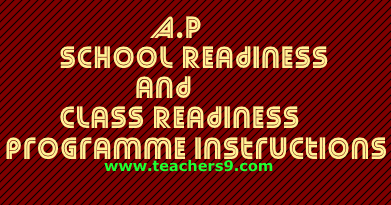 Resource Material for this programme is a)Class Readiness and School Readiness Modules supplied in Primary and Upper primary levels in previous year. b)Workbooks meant for summer camps for children of classes I&II and III, IV, &V,Snehabala cards and Text books and any other relevant material suitable to the levels of the children. c)Concerned teacher should prepare the activities according to the needs of the child. Out of a total 48 periods at the primary level, 20 periods should exclusively be meant for Mother Tongue & Mathematics only and the remaining hours for the teaching of the other subjects. Daily Home work should be given and it should be corrected. Maintain the children's performance register based on the earlier Annual Assessment Survey grading or any base line grading for 45 days readiness programme. Get the Annual Assessment Survey results conducted by the SCERT use it as the baseline/pre line for 2015-16 for class III,V&VIII and the reaming classes the teacher should conduct the pre test on the below levels of each subject of Telugu/Urdu,English, Hindi and maths. To record the class wise subject wise student performance of pre line and end line results in the prescribed formats of each school. Every teacher should mentain the children performance track records according to the levels furnished by SPO. Level III: Identification, Recognition, and Pronunciation of language items. Level IV: Reading and Writing of the Language items. Level V: Reading and Writing of the words in the mother tongue. Level VII: Perfection in the language skills. Level III: To be able to do the two digits subtractions according to the class standards. Level IV: to be able to do the two digits multiplication according to the class standards. Level V: to be able to do the two digits divisions according to the class standards. Level VI: to be able to grasp the tables according to the class standards. To identify the children those who are lagging behind the basics in Mother tongue and Mathematics. To ensure that every child acquires the stated Reading, Writing and Arithmetic in Mother tongue and in Mathematics before 5th August 2015. After completion of the training programme every child should attain the basic skills in languages and Mathematics. a)To conduct weekly meeting to review the children's performance, b)To provide necessary academic support and monitor every class, c)To take the responsibility to implement the programme.